To be fair, I haven't been doing much work today either. Too much Time on my hands. I found "List of helicopter prison escapes" only a quarter as entertaining as "List of quadcopter prison escapes." rhomboidal wrote: I found "List of helicopter prison escapes" only a quarter as entertaining as "List of quadcopter prison escapes." I can't see how that would work, unless you had a swarm of quadcopters to distract the guards while you made a run for it. Maybe it's using a quadcopter to smuggle stuff in? A drone flies into prison with a cake, the cake is actually hiding a file. If I had one of these it would have a quarter "Reading webcomics" and another quarter of "Messing around with the key and instuments of MIDI files." Get a big one (or nail a few together). Drop it in to the prison yard at the right moment and bob's your uncle. wow -- has it really been 500 comix since the initial frame of TIme? Like they said in school, "Time passes. Will you?" Hmmm.... according to the webz, in 1690 the clarinet was invented, so it can't all be bad (says a forme clarinetist). OTOH, according to Wikipedia, "February 3 – The Massachusetts Bay Colony issues the first paper money in North America." So, at least for the diehard gold-standard folks, it's all been downhill since then. regarding the alt text: Rule 34? Randall replaces light sabers with metal swords. Wouldn't it be more believable to replace them with cardboard tubes? RogueCynic wrote: Randall replaces light sabers with metal swords. Wouldn't it be more believable to replace them with cardboard tubes? The digital edit of Star Wars might be asking a bit much, but it seems all too likely that by this comic Randall shall will this Jack and Diane remix into existence. A quadcopter smuggles in a cake. Inside the cake is a quadcopter carrying a file. Jorpho wrote: The digital edit of Star Wars might be asking a bit much, but it seems all too likely that by this comic Randall shall will this Jack and Diane remix into existence. Like StackSort, I think Randall just mentioning something like that in a comic is enough to inspire someone to create it. I wonder if that remix could top mom's spaghetti. Needs a time-tracking software. The last potentially sexually active pope in the list (!) died 1829 (and the next to last 1555), but the first manned helicopter flew in 1901 (and probably in better conditions than a helicopter prison escape), and the first helicopter escape in the list was 1971. One man's activity report is another man's schedule. I now know what I'm doing the rest of this week. I don't get it. Why is this funny? All I'm getting is "I'm so quirky, even my procrastination is quirky! Much quirkier than Reddit or flash games! Those aren't be quirky at all, lol. 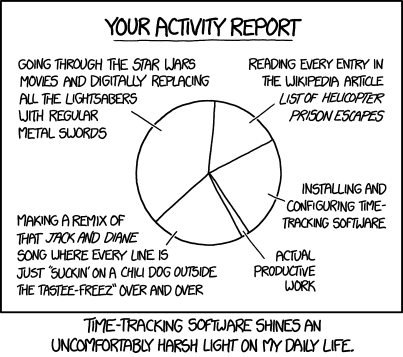 Also, installing time-tracking software has wasted a bunch of my time! Soooo ironic! And Wikipedia has some quirky articles! That's probably ironic too, somehow." Is there...more to it than this? ps.02 wrote: I don't get it. Why is this funny? Sometimes Randall just makes geeky observations intended to deliver a wry smile. You either relate to it in a GOOMHR kind of way or you don't. This one reminds me of when you spend the time you were meant to spend revising for exams planning out how you are going to revise for your exams, making charts with colored stickers and text and so on. As always, you can't make a joke funnier by explaining it though. ps.02 wrote: I don't get it. Why is this funny? All I'm getting is "I'm so quirky, even my procrastination is quirky! Much quirkier than Reddit or flash games! Those aren't be quirky at all, lol. Also, installing time-tracking software has wasted a bunch of my time! Soooo ironic! And Wikipedia has some quirky articles! That's probably ironic too, somehow." ps.02 wrote: you spend the time you were meant to spend revising for exams planning out how you are going to revise for your exams, making charts with colored stickers and text and so on. This is the inevitable outcome of the kind of environment I used to work in plagued by "consolidation creep", where each level of bureaucracy has a deadline for when its summaries have to be submitted, meaning that the next level down has a deadline slightly earlier than that to give the upper level time to format the summaries. Repeat over four or five levels and you can well end up with a deadline that precedes the actual period you're reporting for. So individual time sheets for the Monday-Friday work week were due no later than noon on Thursday. I understand the need for accounting for it all, but if I'm straight-salaried (no overtime, except for exceptional circumstances, but not uncommonly finding it necessary to run to a ten-hour day, not even including time out taken to contribute to places like here) and nothing I do directly impacts client charges (save that if I didn't do them, the people with the actual client-charging activities would be unable to complete their work as quickly, which arguably means I'm a negative cost to the client...) then ascribing perhaps 7% of my day to telling people who already know the necessarily imprecise details of what I might have been doing for the rest of it... always seemed nonsensical. Then, one leaves the academic environment. you can well end up with a deadline that precedes the actual period you're reporting for. So individual time sheets for the Monday-Friday work week were due no later than noon on Thursday. Maybe, someone will pick up 'the slack' and file Sick Leave for you. well ... sense you are dead and unable to file for yourself. That system might be very useful. It might, simply, be Named Wrong. "This is my Professional Expectation Sheet." You'd only get paid for projects listed on your PES Report. mattiep wrote: This ain't bad, but we need the autotune version that follows the tune of the original. I never much cared for the notion of sucking on a chili dog. That is not something you do with a chili dog. And for the longest time I thought "hand between her knees" was much, much dirtier than it actually is.